FILE - NATO Deputy Secretary-General Alexander Vershbow speaks during a media conference in Vilnius, Lithuania, March 24, 2016. Relations between the European Union and the NATO alliance have rarely been closer, a senior NATO official says, and never as important as they are now, as the West confronts complex challenges ranging from the Middle East and North Africa to Russia and the Kremlin's aggressive foreign and defense policies. Separately, NATO Secretary General Jens Stoltenberg announced Friday that the NATO-Russia Council, will meet in Brussels in about two weeks on Ukraine and other issues. Vershbow addressed the European Union Inter-Parliamentary Committee in The Hague Friday. He said the EU and NATO are working together to manage the humanitarian migrant and refugee crisis in Europe and control the spread of violent extremism. 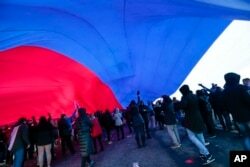 People hold a huge Russian flag during a rally to celebrate the second anniversary of Russia's annexation of Crimea just off Red Square in Moscow, Russia, March 18, 2016. Russia annexed Crimea in 2014 after a hastily organized referendum. While NATO and the EU have significant roles in building a post-Cold War Europe, “a revisionist Russia” is directly challenging those efforts, the veteran U.S. diplomat said Friday. He cited Moscow's aggression against Ukraine and annexation of Crimea, its occupation of territory in Georgia and Moldova and military maneuvers along NATO's borders. Vershbow said Moscow has “literally torn up the international rulebook,” and evidently rejects the values, principles and structures jointly agreed in Europe in the Helsinki Final Act and numerous post-Cold War agreements. Russia wants to re-establish spheres of influence, Vershbow said, and is prepared to redraw borders, by force if necessary, toward that end. Russia justifies its words and deeds, he added, with a false narrative alleging that the West has sought deliberately to weaken, humiliate and take advantage of Moscow for the past 25 to 30 years. Noting U.S. plans to quadruple military spending in Europe to $3.4 billion in 2017, Vershbow said that huge contribution will help NATO increase its troop strength, stockpile military hardware and arms, and form a rapid reaction force under the European Reassurance Initiative. Stoltenberg said consultations with Russia produced the agreement to convene a NATO-Russia Council meeting. He gave no specific date for the upcoming talks in Brussels. NATO heads of state and government established the council to continue and expand NATO's long-standing political dialogue with Russia.